Pi (Suraj Sharma) attempts to train the tiger. 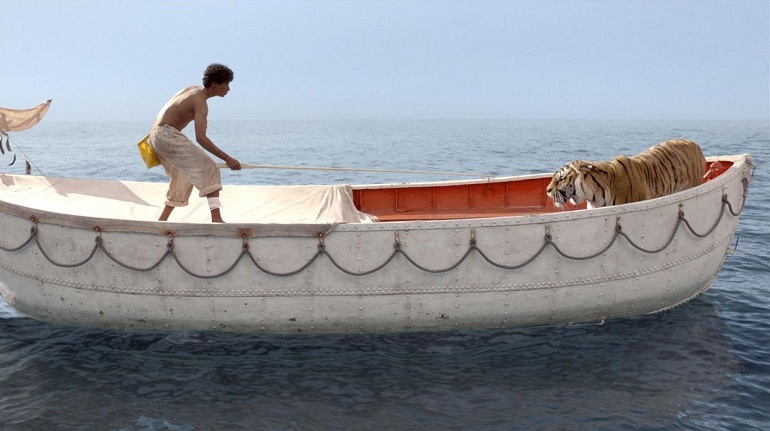 The Life of Pi is an interesting phenomenon in contemporary cinema. I watched it in 3D from the front row of a small cinema – not necessarily the seat I would have chosen (I usually go for the third or fourth row) and the sensation of animals jumping into my lap was definitely odd. I can’t decide if the overall film was just an enjoyable traveller’s tale or whether there is a more profound narrative that I wasn’t reading properly. What is clear is that the film has captivated audiences around the world and set the electronic bulletin boards aglow with questions, theories and seemingly whole packs of ‘trolls’. Like Scorsese’s Hugo, this 3D presentation by a filmmaker with great skill in visualising a story and carefully handling his characters has gone some way to justifying this still cumbersome technology. When Yann Martel’s original novel won the Booker Prize, I remember being put off reading it by the usual nonsense that surrounds awards ceremonies. I’m usually interested in Canadian literature but I didn’t explore this title further. If you don’t know the story, it begins in Montreal where a novelist visits Pi (Irrfan Khan) looking for inspiration for his next project. Pi tells him the fabulous tale of how many years earlier he survived months drifting across the Pacific in an open boat accompanied by a fully-grown Bengal tiger. The narrative mainly comprises a long flashback to when Pi was first a small child in Pondicherry, the French enclave in Tamil Nadu which finally joined the Union of India in 1954, and up to the disaster when Pi was trapped with the tiger as a 16 year-old. Pi’s father owned a zoo in Pondicherry but changes in his financial circumstances forced him to sell-up and take his family to Canada – along with some of the animals which he hoped to sell in North America. At the end of the fabulous tale, the novelist learns that there is another, alternative story about what happened to Pi in the boat and he is invited to choose which one he believes. For those of us who don’t profess any religious beliefs, the film might seem a little off-putting since the novelist is told that the story will make him think again about the existence of God. Yann Martel is certainly interested in ideas about religions and he travelled to India partly to see temples, mosques and churches. As a 14 year-old, Pi tries out Hinduism, Islam and Christianity in his attempt to understand the world. Especially in North America, audiences (and critics) seem to want to focus on the religious dimension. For those of us in the increasingly secular UK (shown in the 2011 census) I suppose it’s good to be reminded that millions of people around the world do have religious beliefs. However, I don’t think that Life of Pi has to be understood through religious metaphors and allegories. It’s a mixture of fantasy and realism that exposes the central character’s humanity. What’s most interesting about the film for me is that a Hollywood studio (Fox) thought that it had acquired a ‘property’ to develop into an American blockbuster movie only to discover eventually that while the film remains ‘American’ in terms of its script by David Magee and the excellent CGI effects work by Rhythm and Hues, everything else about the film is truly ‘international’. The proof is in the box office. Released first in North America, the film made $88 million in what Hollywood calls the ‘domestic’ market – making it a ‘flop’ given its budget of over $100 million. But in the ‘international’ market (i.e. the rest of the world) it has already made over $220 million with the Chinese and Indian markets together making over $100 million. That has to mean something. The film is visually spectacular without the need for much dialogue in many scenes and its story is ‘universal’, but much of the credit must go to director Ang Lee and his refusal to use Hollywood/Bollywood superstars – Tobey Maguire and Shah Rukh Khan are reported to have been considered at some point. Irrfan Khan and Tabu represent the cream of Indian acting talent (note to self – must find more Tabu films) and Gérard Depardieu makes a suitable villain – hiss! – in the present climate (he’s a tax dodger). I thought Suraj Sharma, the 17 year-old student who played the lead, was terrific. Lee made the film in Taiwan, India and Canada and it doesn’t at any point feel like an American film. It was worth staying to the end of the credits to hear the golden voice of Lata Mangeshkar on a song which I think comes from a 1970s Hindi film. I’d like to watch the film again – on a bigger screen – and really get to grips with what Lee and his crew have been able to put together. There is a sequence in which the aspect ratio changes. The action at that moment was itself spectacular so I barely registered the change in ratio. Later I read that there are four different ratios used in the film at various times. In the opening credits sequence, the credits themselves are animated and the 3D effect is pronounced as animals move through the depth of the image. I found this very beautiful and quite arresting – although at other times I didn’t notice the use of 3D at all (apart from the darkened image and the heaviness of the glasses over my own specs). The other success is of course the digital effects that create the tiger on the boat. I can’t imagine that there are many cat lovers (or even dog lovers) that didn’t experience an emotional jolt when Pi lifts the massive head of the tiger weakened by hunger onto his lap. I felt the weight of a ‘real’ tiger and wanted to stretch out and scratch its ears. To return to the India/China axis, Life of Pi seems like a breakthrough of sorts. I don’t think that it was just the presence of Irrfan Khan and Tabu that made me think of The Namesake, a film by Mira Nair, an Indian based in the US adapting another tale of a journey from India to North America. Ang Lee has already demonstrated his ability to make films about different modes of American culture as well as a British literary adaptation and explorations of his own Taiwanese film culture. He’s moved between very different genres and very different cultural contexts with ease. Perhaps with Life of Pi he’s begun to point towards the greater exchange of ideas about cinema between India, China and North America. I think that is where the future lies for cinema in global terms and Lee seems much more adept than the more conventional Hollywood forays into separate productions in India and China. This entry was posted in Chinese Cinema, Indian Cinema and tagged 3D, Ang Lee. Bookmark the permalink.